We arrived into Gare du Nord around 7pm and took a taxi straight to the apartment we rented. We were greeted by a woman named Colette who did not speak any English, but she managed to show us around and was very sweet with the kids. Upon walking into the building, I immediately fell in love with the courtyard. The architecture in Europe already had me swooning, but it was love at first sight all over again every day. This was our first time using a vacation rental vs a hotel. We went through VRBO because the rate was cheaper than AirBnB. They’re also on Trip Advisor (which I later found out, else I would've went that route). The plus side to VRBO and Trip Advisor was the potential to get our 200 euro security deposit back (which we did). They were highly rated on all the websites they were listed on and generally booked in advance. It was a lovely and clean apartment. The neighborhood felt safe. The morning light was perfect. It had a kitchen, a washer/dryer, and a towel warmer. Although, the paint was peeling from the bedroom walls. The toilet was separate from the bathroom (and a walk across the apartment) and it had a tinge of odor (least favorite part of the apartment). We had a stroller, so the elevator outside the unit was great. The location was ideal. It was right by the corner of Rue de Rivoli and Rue d’Alger. Right across from the Jardin des Tuileries. Very close to the Louvre. There were restaurants and markets nearby. It was a short walk from shopping mecca! Had to stop in the flagship Chanel at 31 Rue Cambon! Everyone absolutely adored Olivia there and she got to walk up and down the famous stairway. We hung out at the Eiffel Tower. We rode the Eye of Paris. We stopped by Notre Dame. We walked by the Arc de Triomphe. We walked through the Louvre (and used the Carrousel du Louvre entrance to avoid the crowds). We walked to Pont des Arts and the rumors are true.. it is no longer the “locks of love” bridge (although some have found areas to add locks on). 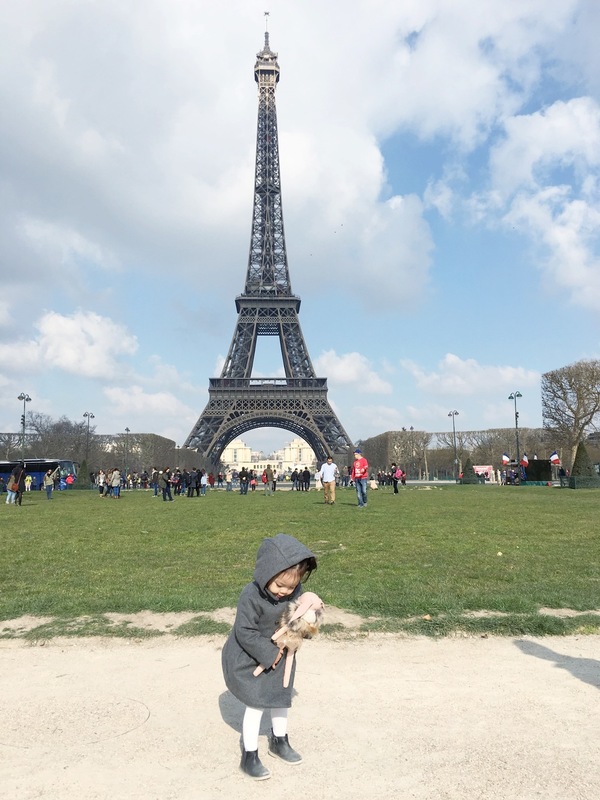 With a toddler, we knew going in that we wouldn’t be going to the top of the Eiffel or doing anything if it was overly crowded. During one of Olivia’s naps, Niti and Bubs walked to the top of the Arc de Triomphe while I walked Liv around Champs-Elysees and Montaigne Avenue. The play areas in the Jardin des Tuileries were a real treat for the kids! There was a playground, a carousel, and a trampoline station. Bubs & Livi enjoyed walking around the gardens as well. Everywhere we go, we always try to find museums. We stopped by the Museum National d'Histoire Naturelle (Natural History Museum) and everything was so beautifully displayed. We spent the most time in the Galerie des Enfants. The kids got to run around and touch/feel anything they wanted. Liv enjoyed hiding in the mouse hole the most. Next time, we hope to visit the science museum because we read great things about the Cite des Enfants! We took photos of our passports + forwarded our itineraries to family before our trip (in the event an emergency occurs). I included the names and addresses we were staying at. I included dates, travel times, and confirmation numbers. I also included places we were interested in going and the areas they were located in. We planned, but left it flexible because, with kids, sometimes you just go with the flow. We rented two pocket wifi units from Hip Pocket. We only rented one in Tokyo and figured two would be better in case we were ever separated. We picked it up from a nearby Chronopost and dropped it off in the mail at Charles De Gaulle with the envelopes they pre-packaged. Everything about it was seamless. We had no issues using it around Paris. Battery never died on us. It was a good speed too. It was definitely a plus to be able to look up directions and reviews of places. We kept our iPhones on airplane mode the entire time and was able to text family and friends using iMessage. I bought a new tripod and bluetooth timer! These are way better than my last ones! We were able to take photos ourselves by gripping the tripod around the handle of Olivia’s stroller. You can hail a cab just like you would in NYC or you can find a taxi line. Green light means they’re available. Red light means they’re not. Most of them spoke english too, but be prepared with a written address for them! Our friends told us that Paris smelled. We went when it was a bit cold, but we didn’t notice any smells or odors out of the norm. People say the French are miserable. Even our cab drivers in London. We did not experience any of that! Everyone was kind and courteous. We always greeted people with a Bonjour and we used simple phrases we know (brushing up on my high school French classes). I think they appreciated the effort as we are visitors to their country. Using a stroller wasn't so bad. There were some areas/places with only stairs to gain entrance, but it wasn’t like Tokyo. I totally hated it in Tokyo, but Europe was definitely more family-friendly. We never used the train after the initial entrance into London or into Paris. We’re a family of four and decided it would be easier to use taxis to get anywhere. We brought home a bunch of Kinder Surprise Eggs (purchased from CDG airport) and had no issues bringing them into the US. Yes.. that is really a thing. Centre Commercial Kids was, by far, our favorite shop in Paris. They have a wonderfully curated selection and we ended up bringing back a lot of gifts from here. Take your passport (or a copy/photo of it) with you while you shop to obtain paperwork for a VAT refund if you are not from the EU. Our refunds ranged from 10-13%. Take a photo of all of your receipts and refund forms so that you have a copy should anything go wrong. De-tax BEFORE checking in for your flight! You may have to show your goods to the customs agent. If this is your last EU stop (including layovers), you can check-in anything so long as you’ve gone to customs first. We had an open box and checked a few gifts in so we wouldn’t have to carry it on to the plane. I would recommend carrying any valuables with you on the plane though. You de-tax at your last EU stop. Ours was Paris with no layovers. We scanned most of our forms on the Pablo machine. You’ll choose your language and then scan your form. If it lights up green and says you’re okay, that’s the equivalent of a customs stamp. You do not need to mail that form in. Keep it for your records. If it lights up red, you have to stand in line to have an agent stamp your form and possibly check your goods. Only two forms were rejected by the Pablo machine for us. They stamped our forms, but they did not check our goods. Make sure your full address and your full credit card number is present on the form. You’ll be mailing the manually-stamped forms in the envelopes provided (take a photo for your records). At CDG, there should be a yellow postal drop nearby the customs desk. All the forms have a doc-id number. You can track your refund via the appropriate website with that number. Should something go wrong, you can always refer to the number and the photos you took. You’ll be able to email them the photo of the forms and receipts to get your tax refund should the physical forms go missing. Refunds from the Pablo machine usually take about a month, but can take up to 3 months (some showed within 2 weeks for us). Refunds that were mailed in can take 1-3 months to show up and are slower to show than the ones that scanned okay. We have a potty-trained toddler, so thinking about toilets was at the top of our heads. When she has to go, she has to go! I was quite nervous about this before the trip. Niti suggested we have her in pull-ups, but I was adamant about not moving her a step back. That and diapers and pull-ups never really agreed with her (she would get rashes). Instead, we opted to pack potty-liners and waterproof mats (we have two in different sizes.. here and here). Because our flight to London aligned with Liv’s bedtime and she still has accidents from time to time (I usually carry her to the toilet once in the middle of the night to let her pee to prevent this. She’s usually half asleep, but it works for us.). We laid a waterproof mat on her seat so she could sleep on it. No accidents on the plane! We also used the mat on our hotel and apartment beds as a precaution because I doubt they use a waterproof mattress protector. Everywhere we went, I packed a bunch of potty-liners and an extra pair of clothes for Olivia in her little backpack. These potty-liners are AMAZING!! Public restrooms kinda freak me out. The thought of having to take a toddler into one is borderline scary. We used them on the plane and we used them in public restrooms. No only does it cover the entire seat, it covers the front area of the toilet so her feet/clothes/shoes don’t ever touch the toilet. There are also two sticky tabs to help keep the liner in place. They are not flushable, so you do have to throw it in a trash can after, but the plus side is that it has a waterproof barrier. We’ve tried two kinds of liners and these are way better. From opening the package to spreading the liner open to the coverage. When we left the hotel/apartment, we made sure Liv used the toilet beforehand. Every hour, we would ask her if she needed the restroom (or less if we knew she drank more fluids than usual). If we were leaving from one place to the next, we would take her to the restroom. When we returned to our hotel/apartment for the day, we would take her to the toilet. We never had to rush to find a toilet, but if you ever do need to rush, there are many public sanisettes located around the city. They do take a few minutes to self-clean between use though. You can also run into the nearest cafe and pay a few euros for a coffee or something. If you’re at the Jardin des Tuileries, there’s a restroom near the ferris wheel. We had to pay 0.70 euros per person, but it was SO clean! I’m happy to report.. we had zero accidents during the entire trip! Hawaii: May 29 - June 27, 2016.